We ended up replacing my signature with my plain old name on the final cover. Otherwise, this is pretty much what the final book looked like. But don’t take my word for it! Making the Narbonic collections was always a lot of fun, and I should thank Mike Barklage again for doing such an awesome job on them. Thanks, Mike! Chris Shadioan drew the supp. And, Shaenon, here’s your filk! I really like how the covers of all six Narbonics books look. They work so well, being all black and pink and lavendery. I’ve never really paid attention until just now, but your signature’s G is… entrancing. Ed, more than ever before, i want a “like” button for comments! 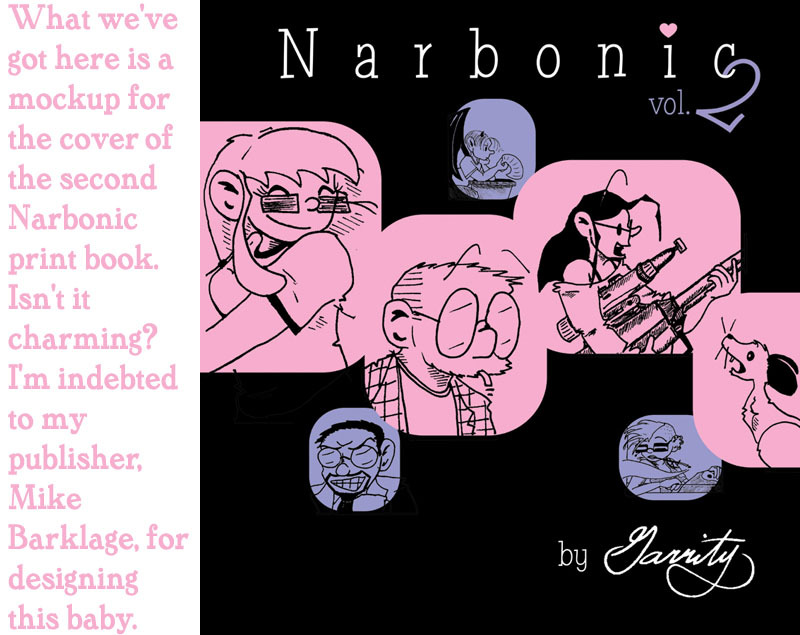 Um, speaking of the Narbonic books, Sarge, a while ago in the forums you wrote, “Meanwhile, I have other Narbonic publishing plans in the works…more announcements soon, I hope.” So…is it “soon” yet?